In the framework of a cooperative program between Phnom Penh (capital of Cambodia) and Ho Chi Minh City, a delegation led by Mr. 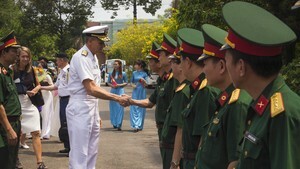 Le Hoang Quan, chairman of the Ho Chi Minh City People’s Committee paid a working visit to Cambodia Thursday. Mr Le Hoang Quan (L) presents Mr. Kep Chuk Tema with a picture. In a meeting with Phnom Penh Mayor Kep Chuk Tema, Mr. Quan said that Ho Chi Minh City will promote its cooperation with Phnom Penh in the fields of economy, education, culture and especially health; and maintain the two cities' long-standing, solidarity and friendship relations. The Ho Chi Minh City delegation participated Friday in the closing ceremony of the program “Bring light to the poor”. The program has been carried out for nearly three years by the HCMC Association for Support of Poor Patients in coordination with the Ho Chi Minh Health Department for the Cambodian patients.